As one of the leading California Real Estate Agent teams in Hollister, Gilroy and Morgan Hill, John & Renee Kunz approach your home buying, selling and investing needs with the same goal in mind. They are focused on your future prosperity, which inspires them to provide such in-depth service and dependable support to make sure you are making the right investment decisions. Buyers – Now is the time to buy! Why? The areas around Carmel, Monterey, Hollister, Gilroy and Morgan Hill are solid investments. Mortgage interest rates are at historic lows offering a good opportunity to invest. Our housing inventories are moving as our market is in gear and stable in a bumpy bottom. All this results in excellent home buying conditions and values for qualified buyers. Whether you are looking for your first or 2nd or vacation home, your dream or investment property, we are committed to providing you only the best and informed service while providing latest market information. Thinking of buying a home? We can help! Contact John or Renee or call them at 831-801-4573. Sellers – San Benito County Real Estate is Healthy! Use our Check your Home Value form at bottom right to see! The decision to sell a home is often dependent on many factors. Whatever your reasons are for selling, our proven effective marketing strategies will ensure that you get the highest possible price for your home. We guarantee to provide you with professional, ethical and confidential service and keep you fully informed every step of the way. There is a lot to do when thinking about selling your house. We can help! Visit our page on Tips for Sellers. Take advantage of our free market snapshot service that allows you to check your home value and the value of homes in your area. Give it a test drive now and be an informed San Benito, Santa Clara or Santa Cruz county seller! Any questions? Feel free to Contact John or Renee or call them at 831-801-4573. 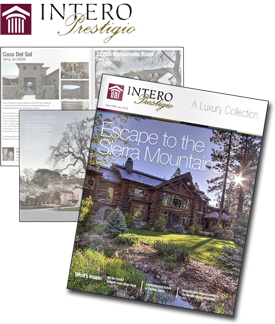 Flip through Intero's Prestigio latest issue and see what dream homes are available! Type in your address and you'll receive your free comprehensive home report in just a few minutes!